Quantum technology makes a great leap forward. While scientists can control a few qubits with great reliability, it doesn’t yet look like a real computer. Useful quantum chips require programmability: the ability to perform an arbitrary set of operations. Scientists from QuTech in Delft have now realised a programmable two-qubit quantum processor in silicon successfully implementing two quantum algorithms. They have published their work in the magazine Nature. The quantum computer of the future will be a game changer in the area of large and intensive calculations. 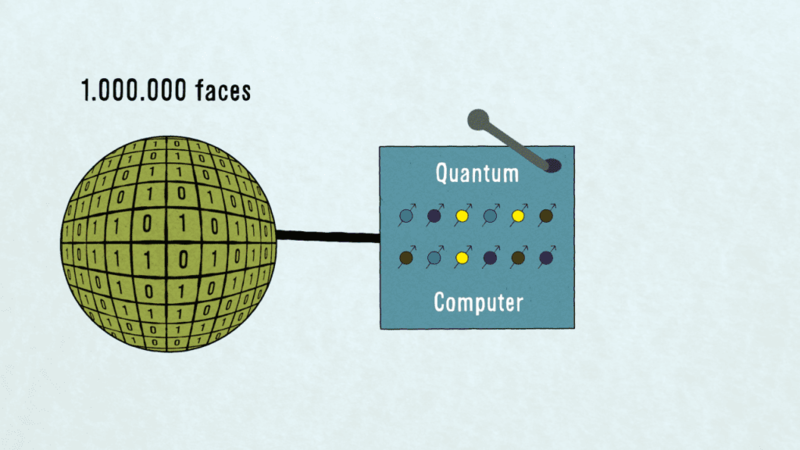 By using quantum superpositions and entanglement of quantum bits (qubits) calculations can be performed in parallel. Professor Lieven Vandersypen expects that this will make calculations that are practically impossible for classical computers, such as factoring large prime numbers and searching large unsorted lists, possible in the future. In recent years, scientists have achieved ever better qubits. These few qubits are now measured and manipulated with such high reliability that useful programming becomes important. To be able to perform universal quantum calculations, operations that control the state of individual qubits and intertwine multiple qubits in a controlled way are required. ‘This set of operations must be available in such a way that we can place them in any order to perform different algorithms ‘ explains Tom Watson,’ that is what we call programmability’. Using the reliable operations in the two-qubit quantum chip, the scientists managed to program and execute the first quantum algorithms. The first algorithm, the Deutsch-Josza algorithm, tests whether a function is ‘even’ or ‘odd’. Watson: ‘It’s like you only have to throw a coin once to see if both sides are the same or not.’ They also performed the so-called ‘Grover-search algorithm’. This algorithm searches for the right answer in one go in an unsorted set. This example of a programmable quantum chip with reliable silicon qubits is an important milestone towards realizing reliable and scalable quantum calculations. Scientists showed that the qubits are controllable, can be entangled with high reliability and that operations can be combined to perform a quantum algorithm. ‘In order to be able to execute more complex algorithms, we will develop silicon quantum chips with more qubits, both in the Delft cleanrooms and in industrial cleanrooms with our partner Intel’, states Lieven Vandersypen.